There is great excitement among the pupils from 1st to 6th class currently as Mr. Sheehan is teaching chess to these classes weekly. We hope to attend (and host) chess tournaments annually. As parents are inquiring about how to play I will post the instructions here as we progress. Make sure there is a white square to your right (think “white to the right”). Shake hands with your opponent before and after each game. Start: Each player has 8 pawns. 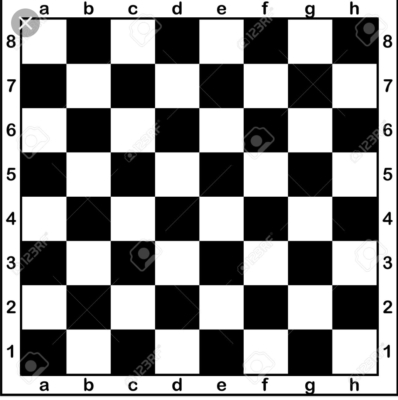 They start in the second row ( in above picture pawns start in squares A2, B2, C2….H2 and squares A7, B7, C7…H7. Move: Pawns can only move straight up the board. The first time you move each pawn you may move it 2 or 1 squares. For each subsequent move, the pawn may only move 1 square. Capture: Pawns can capture other pieces by moving 1 square diagonally forward to the left or right (1 square in a V shape). Played with just 8 pawns. Switch sides after the first game. If the score is 2-0, play 8 pawns VS 7 pawns. If you touch one of your own pieces, you must move it (if possible). If you touch one of your opponent’s pieces, you must capture it (if possible). Start: They start in the extreme corners of the board (squares A1, H1 & A8 and H8). Move: They move straight vertically or horizontally any number of squares. They can move forward and backwards. They can not jump or move through pieces. Capture: A rook can capture any opposition piece in its way (but only one at a time!!). Set up as the Pawn Game, add 2 Rooks to each side. If the score is 2-0, play 8 pawns VS 7 pawns or with 1 rook. 8 white Pawns against 1 black Rook. White moves first (as per usual). To win: Capture all of your opponents pieces or get a Pawn to the opposite side. After playing a game, swap sides.